Join us for EARssentials 2019, to be held July 15-19! Registration is now open. Contact Elyssa Monzack, Ph.D., NIDCD intramural chief of staff, by April 15 to apply for a slot in the course or to reserve a seat at the lectures. 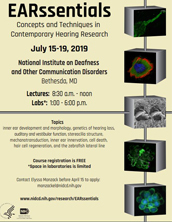 This free, week-long course, hosted and taught by scientists at the National Institute on Deafness and Other Communication Disorders (NIDCD), part of the National Institutes of Health (NIH), provides students with an overall conceptual view of the auditory system as well as hands-on exposure to laboratory techniques unique to research on the inner ear. The primary audience for this course is new intramural NIDCD trainees, including post-doctoral, graduate, post-baccalaureate, and summer students. Scientists from other institutions are welcome to attend as well. The course is also useful for others who want to learn about concepts related to the auditory system. Lecture sessions in the mornings, in which scientists introduce and discuss a wide array of concepts related to the auditory system. Lectures are open to all who register. Contact Elyssa Monzack, Ph.D. for more information. Hands-on laboratory sessions in the afternoon. Each session will feature a different technique commonly used in hearing and balance research. Space in the lab courses is limited. Contact Elyssa Monzack, Ph.D. to apply. All lectures and lab sessions will be held on the NIH campus in Bethesda, Maryland. Campus map. A full list of courses and faculty members will be posted soon.